*Above photo shows student being shown a bag of appleseeds - an appleseed is the size of a six week old unborn baby. School presentations evolved from the Pro-life Prayer Pillow ministry, which started in prayer through the heart of a seven-year old child (click on light blue text for more information about the pillows). There are three calls that have developed from the Pro-life Prayer Pillows which we incorporate into our pro-life presentations. These are: 1. Prayer, 2.Action, and 3. Truth. The K-4 presentation is focused on sharing the truth about the miracle and gift of each child. This is done in a very age appropriate, child-friendly way by sharing song, Scripture, and fun, interactive presentation techniques. There is no mention of abortion in the K-4 presentation and each presentation can be catered to your desires and needs. To find out more, read below. Playing music, Nikki Schaefer teaches kids about the gift of creation and God's love for them. Sharing Scripture, Nikki teaches about what Jesus says about children and about God's love for each person made in His image and likeness. Hiding apple seeds and peas in the room, Nikki involves the kids in discovering the miracle of life - that even though we were only the size of an apple seed, we had a beating heart, tiny hands and feet and much more. ​ Students also have the opportunity to see a live ultrasound with pregnant volunteers and professional ultrasound technician. K-4 kids have an opportunity to hear about how a seven-year-old created the Pro-life Prayer Pillow in prayer. These pillow remind us that all life is beautiful, that all children need love and prayers, and they help to raise money for parents who need extra support in buying diapers and clothes for new babies. K-4 kids are then also inspired to act. They can help sort rosaries, cut ribbon for the Pro-life Prayer Pillows or/and sell pillows at their parish masses. K-4 kids can also hold their own diaper drive or baby shower and give items to their local pro-life organization. Photo above shows student sorting rosaries which are then placed in the Pro-life Prayer Pillows. Kids can pray with song and Scripture throughout presentation. Kids can also receive a rosary and/or prayer card and a little baby during the presentation. 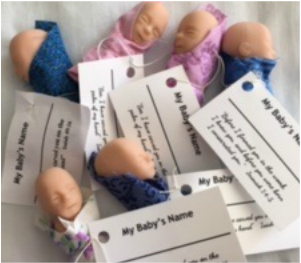 They are invited to name their baby and bring it home as a reminder that all babies are beautiful and precious, created by God. This baby is also a beautiful reminded that they too are created in God's image and a precious child of God. To view prayer cards and Scripture that go with babies, click Learn More tab.